Investors: Affordable 2-bedroom ground-floor townhouse in Tiffany Gardens. Ideal mature tenants have lived there since 2009 and are willing to enter into a new rental agreement for $1,100/month plus utilities to stay. Complex has new windows and exterior doors. Original wood fireplaces decommissioned but ideal for electric insert. Large master bedroom has door to bathroom. 75 sq.ft. 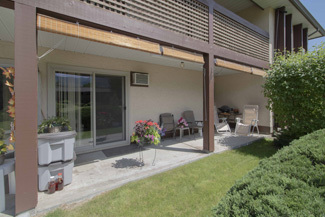 covered patio opens onto landscaped common property. Rentals permitted, 19+, no pets.